We’ve compiled our top bucket list must-do’s for travelling here in Phuket. Having lived on the island, we’ve grown to discover all the best hotspots and hidden gems around Phuket. So if you’re a keen traveller, love a photo opportunity and have a passion for exploration, you’ll have to check these spots out. 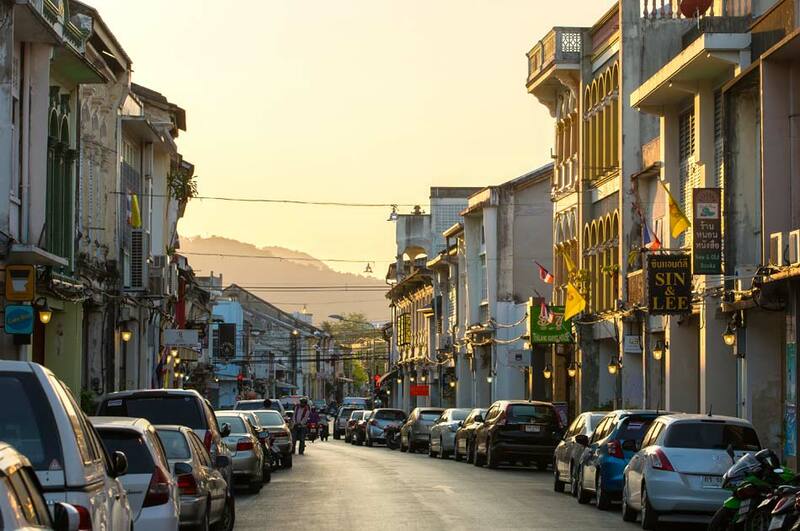 The bustling streets of Phuket Old Town are filled with vintage coffee shops, cafes and restaurants. The ornate architecture and street art are the perfect backdrops for any photo. Sundays are the best for Phuket Town as they have the famous Naka market on, with stalls and stalls of Thai cuisine and souvenirs. Feast of some of the best and cheapest Thai foods and immerse yourself in classic Thai culture. Big Buddha is a famous attraction here in Phuket. Based high up, you’ve got the choice to walk, run, cycle, or drive your way up the hill to reach the beautiful Buddha. Early morning is our favourite time to visit as you miss the tourist crowds and may even get to catch the beautiful sunrise. It’s the perfect meditation spot… and you even get a workout in too! Promthep Cape is probably the best sunset spot in the south of Phuket. Watch the sun go down over Nai Harn beach. From 6-7pm this spot is packed with tourists and photographers, so make sure you get there early to get the best view. Just past Nai Harn beach is the hidden away Ao Sane beach. Easily missed, this beach is nestled away and is the perfect place if you’re looking to miss the crowds. Clear waters and beautifuls views, with a restaurant too to keep you hydrated and fuelled for your day in the sun. If you’re venturing up the north of the island, be sure to check out Boat Avenue. Easily mistaken for somewhere like Spain, this area is filled with trendy restaurants, clothing shops, shipping container cafes, bars and homeware stores. Beware, things tend to be more pricier and exclusive up this end of the island. Boat Avenue is just a short drive away from the beautiful Kamala beach and Surin beach too!